The incident is the latest green-on-blue attack in Afghanistan. An attacker in an Afghan National Army uniform killed a U.S. Army major general in Afghanistan, according to U.S. government sources. In addition to the major general, 15 other military personnel were wounded in the attack. Among the fifteen, three Afghan officers and a German brigadier general serving with NATO were injured. The attack comes after a relative lull in the frequency of so-called “green on blue” attacks—attacks carried out by rogue Afghan soldiers against U.S. and NATO troops in Afghanistan. The confirmed death of the U.S. major general, who remains unidentified by the Pentagon at the time of this report, marks the highest-ranking U.S. military casualty in the 13 year Afghanistan conflict. The attack occurred just outside a U.K.-run military academy, Camp Qargha, on the outskirts of Kabul on Tuesday. The White House has been relatively quiet on the incident, with press secretary Josh Earnest stating that the Obama administration was unable to give “any information on the motive or circumstances surrounding the attack.” The BBC reports that the attacker opened fire following an argument. U.K. officials are also tight-lipped about the attack at the moment, stating that “it would be inappropriate to comment further at this time.” Green-on-blue attacks are a sensitive political issue in the fraught bilateral relationship between the U.S. and Afghan governments. In general, these sorts of “insider” attacks have decreased in frequency since 2012 when they reached their peak. As I have previously discussed in The Diplomat, completely preventing these attacks seems to be an intractable problem for the Afghan National Army and Security Forces. Earlier this year, “rogue” attackers within the Afghan police and security services shot and killed three American doctors and a Pulitzer Prize-winning photo journalist. While most attacks stemming from an Afghan defector have been carried out against U.S. and NATO troops, attackers have also attacked civilian targets. So far, there is no concrete reason to believe that the attacker was motivated by links to the Taliban or anti-coalition forces. According to The New York Times, Zabiullah Mujahid, a Taliban spokesperson, noted that the group is uncertain whether one of their loyalists carried out the attack. He nonetheless praised the attacker, called him an “Afghan hero soldier who turned his weapon against foreign invaders.” Several green-on-blue attackers are motivated purely by personal reasons. 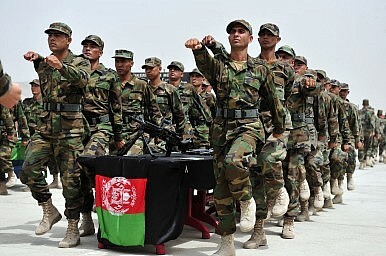 In recent years, the Afghan National Army has grown dramatically, resulting in individuals discontented with the U.S. and NATO presence in the country donning the country’s uniform. U.S. and NATO troops will largely withdraw from Afghanistan by the end of this year and are expected to leave a small residual force behind to aid in limited counterterrorism operations and training.